Acer’s new Aspire S5 Ultrabook will soon be available. Acer today announced availability of the S5 in the U.S. and Canada starting the last week in June. 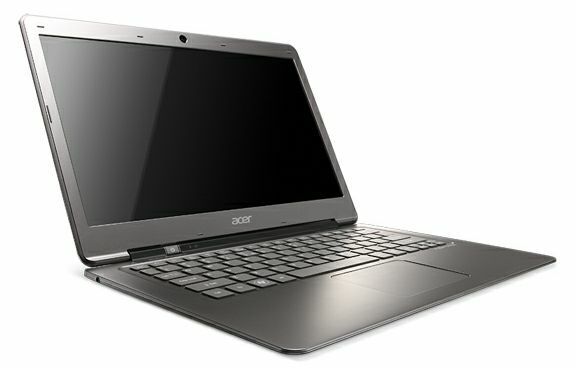 Furthermore, Acer’s first Ultrabook, the Aspire S3, has received a refresh with Ivy Bridge and an even lower starting price. The S3 will ship starting next week. The Acer Aspire S5 Ultrabook is very thin an light with a tapered design that ranges from 15mm at its thickest point to 11mm at its thinnest. The S5 weighs in at 1.2kg. One unique feature of the S5 is the interesting MagicFlip port array. Upon the press of a button, a motor slightly raises the S5 and reveals full HDMI, 2xUSB 3.0, and a Thunderbolt port on the back of the Ultrabook (additionally you’ll find a 3.5mm headphone jack and a full SD slot on the S5). Chippy had a hands-on with the Aspire S5 a while before it launched and shows the MagicFlip port hatch in action. Hopefully there won’t be any breakage issues with this novel feature. The S5 will be sold with Ivy Bridge Croe i5-3317U or i7-35i7U processors, 4GB of RAM, and a 128GB or 256GB SSD. The screen is underwhelming at 13.3″ and 1366×768. The Core i7 and 256GB version of the S5 starts at $1399 and will be available beginning the last week in June in Acer’s store as well as retailers in the U.S and Canada. The Core i5 and 128GB variant starts at $999. You can find full specifications on the Acer Aspire S5 page in our Ultrabook product database. Acer is also announcing a refreshed version of their first Ultrabook, the Aspire S3 [original generation specs here]. 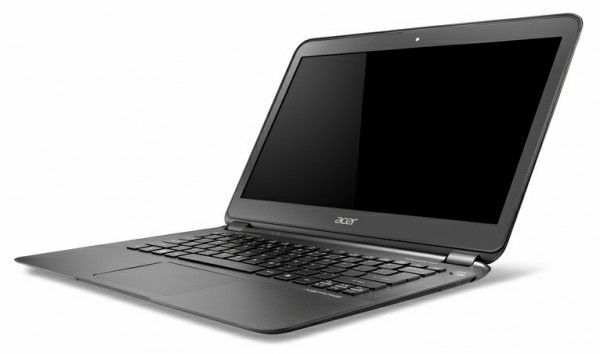 The S3 now represents Acer’s value -oriented Ultrabook. Despite being updated to Ivy Bridge, the S3 starts at a very affordable $648. Depending upon options, which include a Core i3, i5, or i7 CPU, a 128GB or 256GB SSD, or 500GB HDD + 20GB SSD prices can range up to $999. The S3 joins the Sony VAIO T13 and Lenovo U310 as affordable Ivy Bridge Ultrabooks. You can see our review of the original Sandy Bridge Aspire S3 here. The S3 is available starting next week in the U.S. and Canada and will be available in a new ‘champagne’ color. I guess Acer still hasn’t learned from making crappy hardware. Add the S5 and S3 to the dead pool. S3 will have sales, but good luck with S5. Being unfair I think. The pricing is like last year’s S3 pricing, with SSD premium added in. The 256GB, Core i7 is expensive, but the SSD itself is quite costly. In 2012, S3 goes down in price, S5 becomes the “new S3” and S7 is their premium version. Any info on the 11.6″ Acer S7? I’m looking to replace my netbook and it seems to have the smallest bezels (ie. smaller length and width). Thanks. Will the new S3’s battery last more than 20 minutes? The last S3 was a serious piece of junk. Who spends that kind of money on a machine with a 4 hour battery life? (Besides anyone buying the previous U series from Lenovo.) -Poor battery life BURN! Here’s my new theory: Ultrabooks and the new Apple products launch the beginning of the computing industry moving to a profit model like the automobile industry currently and the appliance industry 10 years ago: They make razor thin profits on the initial sale and then really screw you when the device, which was designed to break quickly needs repair. Acer’s advertising their new “extended life” battery to support 80% of the original battery life after 1000 recharge cycles… (A non-user replaceable battery) Samsung’s similar chart shows a typical user hitting the 1000 recharge cycles point after 2 years of use. Non user replaceable batteries are going to result in some pretty pissed off customers of “premium ultrabooks” 24 – 36 months from now.